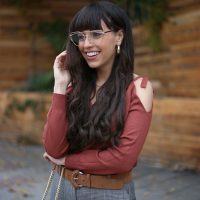 Is this flared sleeves crop top familiar to you? Yes!, In effect! it’s the same crop top that I shown you a few weeks ago but in a different color. I already told you that I loved it too much to have it in just one color haha. Which of the two crop tops you like most? Unlike last time, I decided to wear it with black shades, to give this autumn touch to the outfit. Denim shorts, military cap and sandals. To complete the look, I chose this double buckled belt and a small bag. Do you like the result? ¿Os suena este crop top de magas acampanadas? ¡Si!, Efectivamente es el mismo que os enseñaba hace unas semanas pero en otro color. Ya os advertí que me gusto demasiado como para no tener ambos. 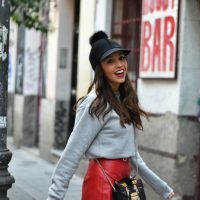 ¿Cuál de los dos crop tops os gusta más? A diferencia de la otra vez, esta vez, decidí combinarlo con tonos negros, que le dieran un toque más “otoñal” . Shorts vaqueros, gorra militar y sandalias. Para completar el look, elegí este cinturón de doble hebilla y un bolso pequeño bandolera. ¿Os gusta el resultado?